Icebergs, scientists tell us, have three fifths of their mass below the surface of the ocean. 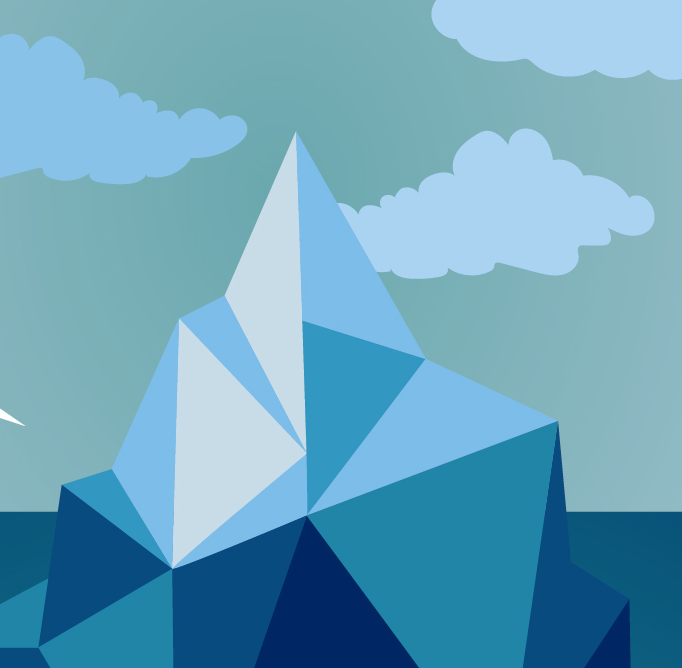 Icebergs are an apt analogy for the cost of litigation. 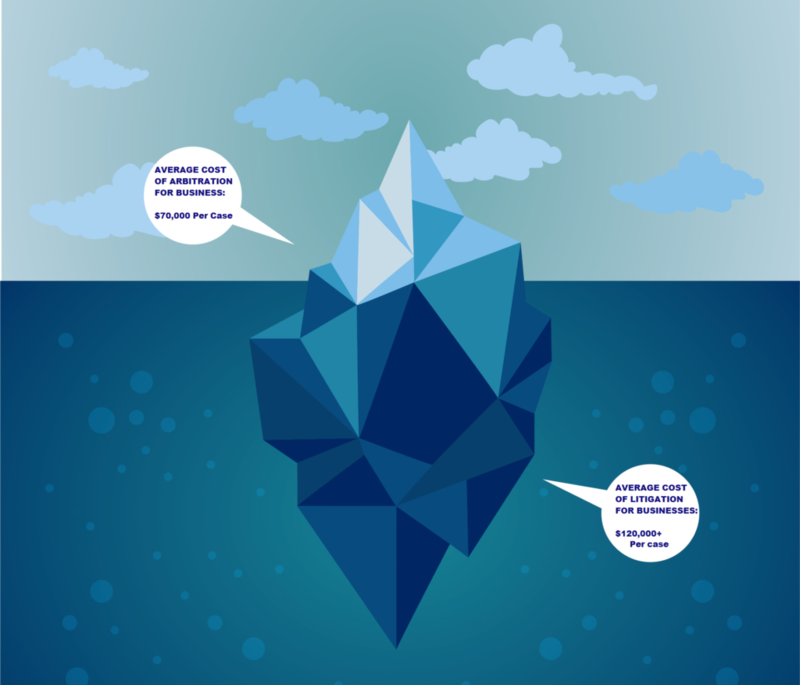 Often, what a client sees or projects as the cost of litigation is dwarfed by the unseen costs. Attorney’s fees are but a portion of litigation costs. Expert fees, document preparation fees, and investigator fees add to the cost. In arbitration, filing fees can cost thousands and the fee for the arbitrator or arbitrators may easily cost thousands for each day of a hearing. In advance of trial, mediation will cost $500 per half day, not including your attorney’s fees. Some attorneys will advance all these case expenses, while others require their clients to pay the expenses as the case goes along. Either way, the client is responsible to pay these fees eventually, so these are real costs. But since the need to hire an expert witness (and pay other incidentals like copying and postage) exists both in arbitration and court, we can ignore those items in our comparison. In litigation (or, in court), filing and service of process fees are smaller (about $500); there are no “hearing session fees.” But, when in court, there is a different expense to be incurred–one not seen in arbitration–the cost of stenographic court reporters. In litigation, much of what happens must be transcribed for the record. Licensed court reporters, as they are known, are not public servants, and they charge about $2,000 per day to take down testimony at depositions and at trial. Extensive discovery–the hallmark of litigation–is thus very pricey. Just a few days of depositions, and the out-of-pocket expenses of litigation will quickly match or exceed those arbitration hearing session fees. Though maybe not by all that much. It depends. Hiring attorneys on an hourly basis is incredibly expensive. Whether the attorney charges $300 per hour or $600 per hour, those hours mount fast. Put that in the context of a securities case, and few folks can afford it. Fortunately for victims of wrongdoing, there is the “contingent fee.” A lawyer working on a contingency gets a percentage of the winnings; if there are no winnings, the lawyer earns no fee. The contingent fee arrangement thus enables alleged victims to hire a lawyer they could not otherwise afford. The lawyer takes the risk of not winning, but he’s not working for free. His fee is a percentage of the recovery (usually one third). A lawyer’s willingness to accept a case on a contingency depends on not just the lawyer’s perception of the merit of the case, but also its size. A lawyer can make only so much from a small case; the potential fee must justify both the work that must be done and the risk of getting nothing. And that’s where the big difference between arbitration and litigation matters most. Litigation involves so much more lawyer work than does arbitration. In court, there are motions to dismiss, interrogatories and depositions, motions for summary judgment, pre-trial briefs, post-trial briefs and the potential for appeals. Litigations can go on for five years (or more), and a contingent-fee attorney working on a litigation must “carry” that case for the entire duration. The lawyer won’t see a nickel until it is all over, including the inevitable appeal. But, according to Forbes, the true hidden cost of litigation is the cost of personal and business stress. The business is stressed by occupying key personnel time with the duties of litigation instead of their job responsibilities. Each day of trial will occupy three days of each witness’s non-trial time. In addition, even the most battle tried employee suffers from personal stress over being a witness or being involved in the litigation or, in the worst case scenario, being the object of a key portion of the litigation – either from their decisions or their actions. All three of these initiators of stress carry direct costs – the loss of the employee’s services – and indirect costs – the minimization of these employees. It is a rare employee indeed, who, once accused of “causing” litigation whether by contract decisions, omissions, or direct action (is not chastened and therefore hesitant to act). This hesitation leads to indecision, inefficiency, and loss. These costs are difficult to measure but are a significant expense nonetheless. On the personal side, stress manifested as anger and anxiety are common occurrences. Add to that the cloud of uncertainty that hangs over the individual as long as the litigation is unresolved. Combined this equals a human, emotional, and physical toll that must be added to the financial cost of litigation. Skilled attorneys seek to minimize all of these costs. Efficient, productive litigation identifies the critical issues and maximizes a successful resolution of disputes through motions, negotiations, mediation, and then trial. But the true worth of the attorney must be measured by assessing how well the attorney minimizes the hidden costs. Good attorneys assume the responsibility for directing all aspects of the litigation thereby reducing stress. Good attorneys remove the crisis of the litigation from the workplace and the home place to allow the business to function normally and the individual to proceed without the burden of litigation stress. Run effectively by a good attorney, litigation assumes the role of icebreaker in a sea of icebergs seeking and solving problems as opposed to a titanic, surprised by the mass of a given problem and unable to handle the true cost of litigation. At Landwehr Law, we help with Arbitration to save you or your business the pain of Litigation.